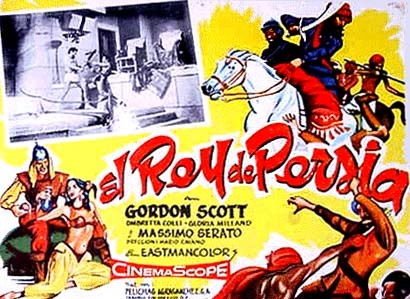 A poster of "The King of Persia", here in its Mexican version "El Rey de Persia" was one of the numerous American-Italian co-production films in the "Sword and Sandles" genre that was quite popular in the 1950's. "The King of Persia" is supposed to take place in Persia and features actor Gordan Scott (one of the actors who succeeded Johny Weissmuller as Tarzan) and Italian actor Massimo Serato. Such films were usually shot in Cinnecita Studios in the outskirts of Rome where studio production costs were much cheaper than in the United States.These small budget films could be compared to some Stallone or Schwatzenegger early films and were usually a pretext for uncomplicated stories with a good dose of fighting scenes and a simple love plot involving beautiful European stars of the time. Many French Stars like Brigitte Bardot or Mylene Demongenot made their debuts in such movies before becoming cinema icons.